and Other Strippit Control Types. Strippit CNC Controls. But these People Rarely know what they are Taking About. which they Certainly Are Not! You Need To Know Exactly What TYPE of HECC80 Control It Really Is! HECC80 is a Acronym for "Houdaille Electronics Computer Control"
and the 80 is from Intel 8080 Microprocessor that was First Used in them. There are 2 Main-Types of HECC80 Controls. and the Second-Type HECC80/3 Controls. Pre-Regulator takes Raw D.C. Voltage (about 12 to 13 VDC) from Floor-Plate Assembly, Pre-Regulates it to a Clean Voltage (about 8.5 to 9 VDC) before sending it to Each Circuit Board's 5 Volt Regulator in Card-Cage Assembly. Without Clean 5 volt Power to Chips, anything can Happen. The 2 Power-Transistors Mounted on Pre-Regulator Panel get Raw DC Power through a Wire & Ring-Terminal on 1 of 2 Mounting-Screws. Over time, Insulation underneath Crumbles and Connections gets Loose, Corroded, and Electrically Intermittent. We put additional Nylon Insulator Washer on Screw, Solder (Not Crimped!) a New Ring-Terminal on Wire with a Second Wire & Ring-Terminal to Loop-Over to other Mounting-Screw, so Transistors Now get DC Power from Both Mounting-Screws. Repeat for other Transistor. Work Needs to be done by a Good Technician. 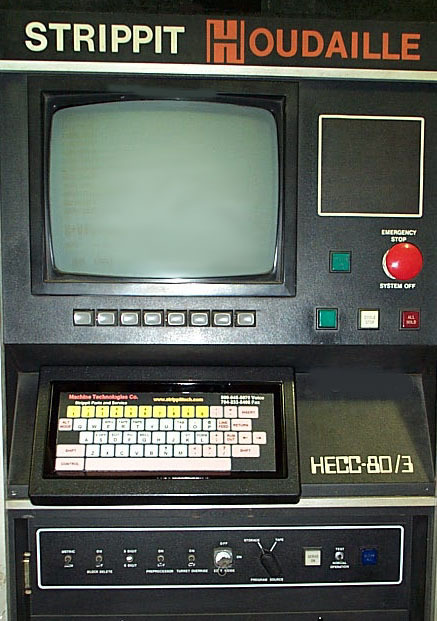 First Type of HECC80 Controls are commonly called the HECC80/1. They are easy to distinguish by 1-Line Self-Scan Display Unit and small Keypad used for Data-Entry, like Control pictured at left. A Great Advantage for Strippit, to Design & Manufacture Their Own Custom CNC Controls for Their Punch Machines. Houdaille Electronics was 5 miles up the road and was really Part of Strippit. All of HECC80/1 Type Controls are closely related, and many of their Circuit Boards are interchangeable, But Not All! IBM shipped their First PC Computer! as shown in the Picture at left. The Family of HECC80/3 Controls are also Closely related to each other. --- HECC80/3 First of this series of Control, used only on FC1000/3 Machines. Featured Intel 8085 Microprocessors on 2 CPU Boards in Slots 2 & 10, CRT Display, 32K of Ram Memory with Battery Back-up, full Keyboard, and the G.E. Model 3 Servo for High Axis Speed (3000 IPM). Most of these Controls were later Retrofitted in the field to HECC80/302 Status, to get the Advantages of Bubble Memory Board. Around 30 of these Controls were build in 1981 to 1982. --- HECC80/302 Basically an Updated HECC80/3 Control used only on FC1000/3 Machines. L6 Prom Board was replaced with #401350-000 256K Bubble Memory Board which provide 128K of Memory for Customer's Part-Programs and 128K for Machine & Control Executive Run-Programs that ran Machine. Ram-Memory also upgraded to 48K using 3 -- 16K Ram Boards in Slots L3, L4, & L5 on early Controls, and 1 -- 48K Ram in Slot L3 on later Controls. Servo Drives were upgraded from G.E. 3 Drive to Much improved G.E. 3A Drive. Built from 1982 to 1986, uses #401473-000 Schematics. --- HECC80/302A A Updated HECC80/302 Control to Latest-Style Circuit Boards for Improved Reliability. Used only on the "Reliability" Series FC1000/3 Machines, which also had many Mechanical Improvements, which began with Machine Serial #200. FC1000/3's with 302A Controls are the Best of the HECC Control Machines. Made in 1984 to 1986, uses #401722-000 Schematics. --- HECC80/304 Basically a HECC80/302 Control mounded in a Stand-Alone Cabinet, with special Software & Proms and I/O boards for use on FC1500/45 Punch & Plasma Machine. Oddly, Strippit built these Controls first using the G.E. Model 3A Servo-Drives, and later-on using Model 2 Servo-Drives, which are Very Different! Built 1983 to 1986, uses #401470-000 Schematics. --- HECC80/306 Basically a HECC80/302 Control mounted in a Stand-Alone Cabinet, with Special Software & Proms and I/O boards for use on FC1250/30/1500 and FC1250/30/1500 Laser-Tool Machines. Used G.E. Model 2 Servos only. Built 1983 to 1986, uses #401592-000 Schematics. --- HECC80/BC Basically a HECC80/302 Control mounted in a stand-alone Cabinet. Had a Special CRT Graphics Board, Software, and I/O to run the Blanking Center Machine. CNC Right-Angle Shear Machine for Stand-Alone Operation, and Punch-Machine Cell-Systems. Used G.E. 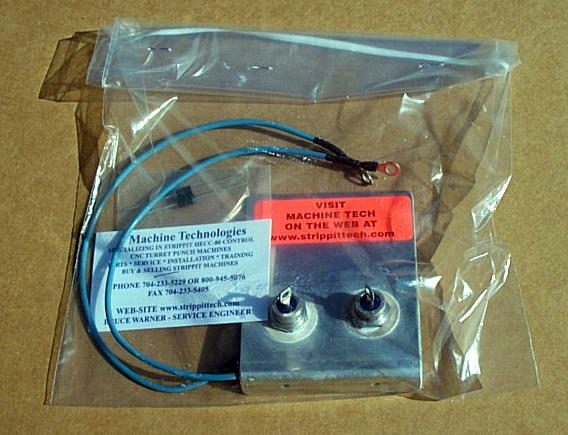 Model 2 Hi-Ack Servo. Built 1983 to 1986, used #401359-000 Schematics. --- HECC80/2 There was also a couple of HECC80/2 Controls build around 1980. These were Special Controls that were Custom-Made for a New Caterpillar Co. Plant that was being built with all Machines being DMC (Central-Office) Controlled. 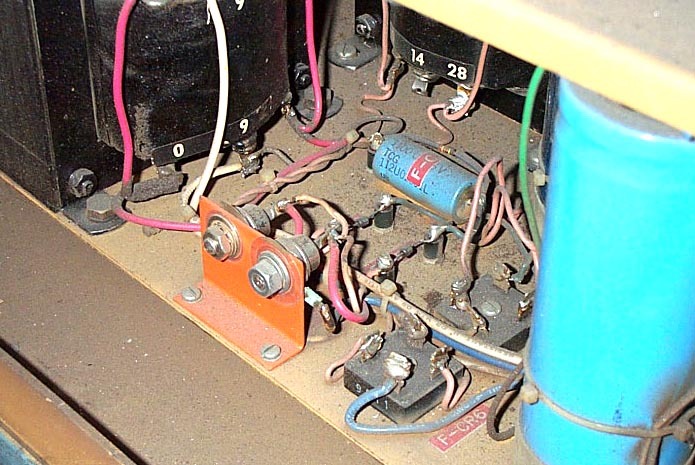 These Early Specials became the Basis for this HECC80/30x family of Controls. These Custom Controls probably do not exist anymore. Schematics #??? Note, All HECC80/3 Controls had a Simple "FAB-5" Macro Programming Language Built-In. Old Part-Programs Written using these Macro's will Only Run on HECC80/3 Controls, and these Macro's are Not Supported by Any other CNC-Control or CAD/CAM Programming System. Please Check-Out the "Bubble Board Adjustment & Fixes" Web Page. The A's were Very Good NC Controls (30S3, 30S4, and HC are Older & Much less desirable) from that Pre-CNC Era, and I still have a few that I keep running at some of my Customer's Shops. 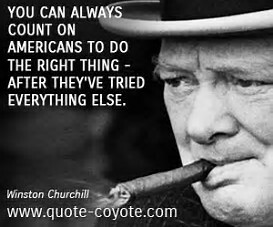 3 Servicemen (Including myself) here in the U.S. (and None Overseas) that I consider Competent to work on them. If you are located far from us, you will Not be able to keep them Running from a Lack of Good Service & Parts. For these reasons, I Recommend my Customer's Scrap their "A" Control Machines, and Upgrade to Newer CNC Control Machines, which Offer More Features, Better Reliability, and Better Service & Parts Availably. No Matter how Enticing "Cheap" Price may be, for the above Listed Reasons! Schematics. Most Early HECC80's were later Upgraded with 2 Prom and 2 Memory Boards to HECC80/1 Status, but there is still a couple of Original HECC80's around. --- HECC80/1 This is an Improved & Upgraded HECC80, built 1979 to 1981. Had 2 Prom boards (HECC80/1 Software) to hold more advanced Executive Machine & Control Run program. 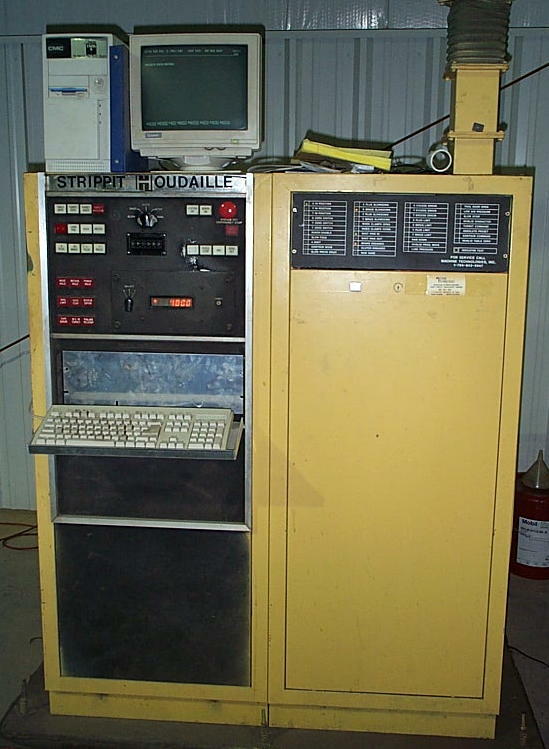 Had 2 Memory Boards to allow Edit & Storing of Part-Run Programs, and was a true CNC Control. Later HECC80/1's had Resolver Excitation Board Upgrades from 2 MHZ to 3 MHZ for better Servo Tuning & Response & Positioning-Accuracy. Many Internal Improvements were also made to Control for greater Control Reliability, including a 6000 BTU Air Conditioner fitted to back of Control to get rid of Heat. HECC80/1 Controls used the #400875-000 Schematic sets. --- HECC80/102 An Updated HECC80/1 Control to allow faster Axis Speed and a higher Punch Hit-Rate. Mainly a Software Change (HECC80/102 Proms) to allow higher hit-rate, and new Position Comparator Board Changes for same reason. Late HECC80/102 Controls had a 3 MHZ Sine-Wave Excitation Board which made a Big Improvement in Accuracy & Servo Response necessitated by HECC80 Controls being used on Laser Machines. I often put HECC80/1 Prom Boards in HECC80/102 Controls because I find they work better at the slightly Slower Punch & Axis Speed. HECC80/102 were built from 1981 to1986, and used #401290-000 Schematics. which is interesting as the New-Model FC1000/3 Machines were first shipped 5 years Earlier! --- HECC80/750 A Repackaged HECC80/1 Control with only 2 Servo-Drives (X & Y Axis), used only on FC750 Machines. Has special Lamp & Control Driver (-300 Type) Board and special FC750 Software on the 2 Prom Boards that will only work on FC750 & FC750/2 Machines. Built 1979 to 1980, uses #400727-000 Schematics. --- HECC80/752 Updated HECC80/750 Control with Prom Software, Position Comparator, and Resolver Excitation Board Upgrades to make Machine Move & Punch Faster. I prefer HECC80/750 Prom Boards in FC752 Machines, because they work Better going Slower. Built 1981 to 1986, uses #401275-000 Schematics. 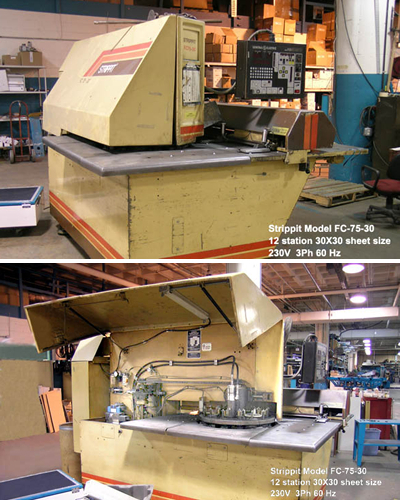 I believe Last FC750/2 Machine was S/N 195050586 built in 1986. --- HECC80/LC Control for Laser-Center, which was a FC1250/30/1500 Punch & Laser-Tool Machine, but without the Punch & Turret, and was a Laser-Only Machine. Basically a HECC80/1 Control without Turret Servo Drive Electronics. Special HECC80/LC Prom Boards. Only about 6 of these Controls were built. Built 1980 to 1982, uses #401239-000 Schematics. --- HECC80/28 Final Type of HECC80/1 Series. This was Special Version of HECC80/1 & HECC80/102 Controls for Laser Tool Machines, & Load / Unload Machines. Also used for first few (about 11) FC1250/30/1500 Punch Machines with 33-Station Turrets as New HECC80/306 Control being built for it, was not yet ready. Engineering needed to make Software Additions to Machine & Control Executive-Run Program to add Laser Improvements, but the 24K of Storage Space in 2 Prom Boards were not sufficient for this. So 4K of Ram Memory Space was Stolen from Ram #1 Board (Ram was now 20K Total) and added to Prom #2 Board for a total of 28K of Prom Program space, hence the HECC80/28 Name. Some earlier HECC80/1 & HECC80/102 Controls on Laser Tool Machines were Retrofitted in the Field to HECC80/28 Status. Build from 1981 to 1986. You have to use HECC80/1 & HECC80/102 Schematics with "Speed Attenuation Retrofit" Print #401352-888 as Strippit Never Bothered to made a set of HECC80/28 Schematics. Note, All HECC80/1 Controls had Simple "Pattern-Repeat" Macro Programming Language Built-In. Old Part-Programs Written using these Macro's will Only Run on HECC80/1 Controls, and these Macro's are NOT Supported by Any CNC-Control or CAD/CAM Programming System. --- "Control Shuts Itself Off 2 Seconds After it is Turned-On"
This is the Most Common HECC80/1 Control Problem there is. The Master-Monitor & Slave-Monitor Boards Check All DC Power Supply Voltages Continuously after Control is Turned-On. If one or more Voltages are Too-High or Too-Low, Monitor Boards will turn Control-Off to prevent possible damage. After Control Shut-Off, a Red LED-Light should be ON on the Master-Monitor (S2-Slot) or the Slave-Monitor (S1-Slot) Board. 1 --- An Electrical-Short on Machine. Check for Smashed No-Punch Zone Sensor on X-axis, Other Smashed Sensors & Switches, Cut or Nicked Wires, Etc. Ohm-Out your VDC (Machine 24 VDC) to LVR (Low Voltage Return-Ground), and the 1DC (Machine 12 VDC) to LVR (Low Voltage Return-Ground) on Machine for Short-Circuits. These 2 Machine Power Supply Circuits should Ohm-Out to at Least a Few Hundred Ohms, if Close to Zero, you have a Short-Circuit Somewhere on Machine, or are reading a Short-Circuit back from a Bad Control Power Supply Board. and we will Test, Repair, and Update them to Current Specifications. 4 Boards Back to Correct Positions, or you will Damage Boards at Power Turn-On! Recheck All Cables Before You Power-On! See The 2 Photos Below For Cable Connection Help! Make Sure Servo Fan is Blowing Air Up through the Servo Boards, or Servo will Trip-Out with a "Servo Down" Condition. Look in Servo Drive Half of the Control Cabinet. There are 3 Servo Drives (2 on FC750's), see if there is a Red-LED Light "ON" on one of the Servo Drives. Red-LED Light is Located on the PWMC Servo-Control Circuit Boards. If so, you have a Over-Current Condition. Turn-Off AC Power to Machine, then Disconnect the 2 Armature Wires going to that Axis's Servo Motor, and restart Control. If LED does Not come on, Motor is probably Bad. We Stock Replacement Motors. (2 for FC1000 T-Axis) Servo Boards for that Axis, and we can Test & Repair Them. All HECC80 Controls came with a Decitek Model 262 Paper Tapereader for Part-Program Loading and to Run Control Trouble-Shooting Test Tapes. 1 -- Upgrade the CPU & 2 Prom Boards (HECC80/1 Controls), or Software-Upgrade (HECC80/30x Controls) to allow RS-232 Downloading directly from a P.C. Computer's Serial-Port to the CPU's J1 Connector using a Special Cable. "P.C. Computer to HECC80 Communications"
2 -- Use a Tapereader Emulator. Tapereader's Cable to Control is Unplugged, then is Plugged into Special Connector Cable that goes directly into Emulator. Emulator Imitates old Tapereader and CNC Control never knows the difference. Both Methods have Advantages & Disadvantages. Machine Tech can help you decide and Install. If you no longer use your Tapereader, then (with the Control Turned-Off) Un-Plug Cable from the Tapereader. Then Wrap a couple of turns of Electrical Tape around it (so No one will try to plug it back in) and tuck it out of the way into the wiring harness. Tapereader uses a Lot of DC Power and makes a Lot of Heat, even if not being used. By Unplugging it, you reduce Strain on the Power Supplies, put less Heat into Control, and help Preserve Tapereader for when you may want it for Trouble-Shooting with Test Tapes. 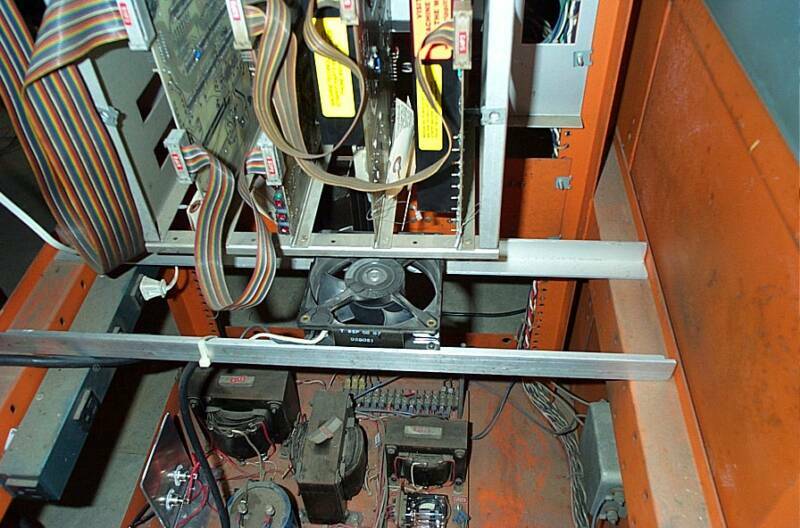 Tapereaders get so Hot that you can Burn yourself just by touching the Black Heatsink around the Motor. This is Normal! But this Heat eventually will Burn-Up Motor. Tapereaders are Expensive to Repair or Replace. 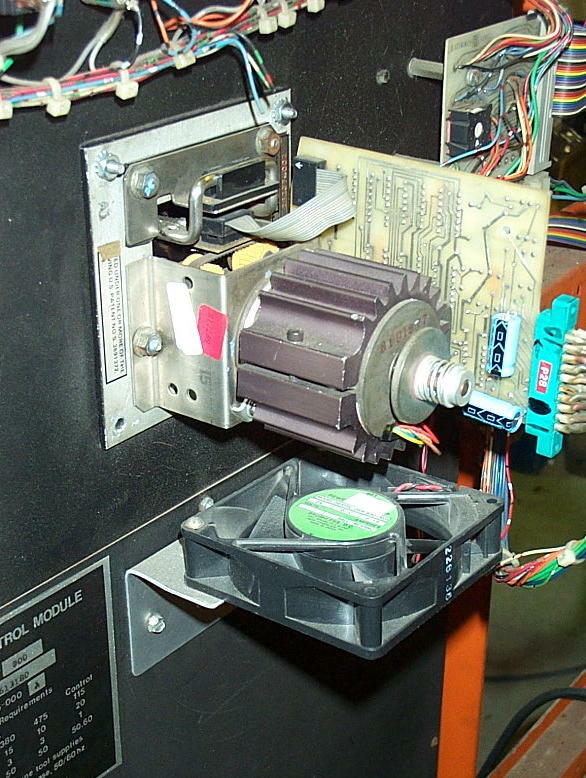 If you still use your Tapereader, then Mount a "Muffin" or "Boxer" Fan underneath it with a L-Bracket, with Fan Blowing Upward over the Motor Heatsink. This will Remove Excess Heat, and help Prevent Tapereader Failure from Motor Burning Out. --- "CHECKSUM ERROR" on Self-Scan Display as soon as you Turn-On Control. (in Slots 3 & 4) Circuit Boards for Repairs and Updating to the Latest Software Revision. causing Intermittent or Bad Power from the Power Supplies. Rubbing-Alcohol and Cotton Q-Tip Type Swabs Only!!! Thin Gold-Coating and Permanently Ruin Circuit Board!!! by removing the Original Remex Tapereader, and Retrofitting a TapeTwin Emulator Computer so that it can Read & Store Programs from Disks. About 400 of these NC "A" Controls (and their Predecessors, the "30S3", "30S4" and "HC") were built from 1975 to 1979. There were other, older NC's built in the 1965 to 1975 Ere, but I will not cover them, as they All Should Be Scrapped by now. 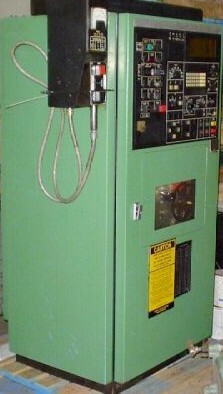 The First FC1000/1 Machines, build in 1975 & 1976, had the First Version in this Control Series, the "30S3". About 30 of these Controls were build. They all had the Westamp Servo PWM Drives, which had a tendency to Burst into Flames, so Strippit was forced to come out with a "Conversion" Kit. To do Conversion, we Unbolted Servo Cabinet from the Control Cabinet, and bolted-on a New Servo Cabinet that used the General Electric Hi-Ack Servo Drives, which worked quite well. Most of these early 30 FC1000 Machines had their Controls Converted, but not all. 30S3 Schematics are #400003-000. Addition Conversion Schematics are #400459-000. The "30S4" Control was similar to the 30S3, but it always came with Large G.E. 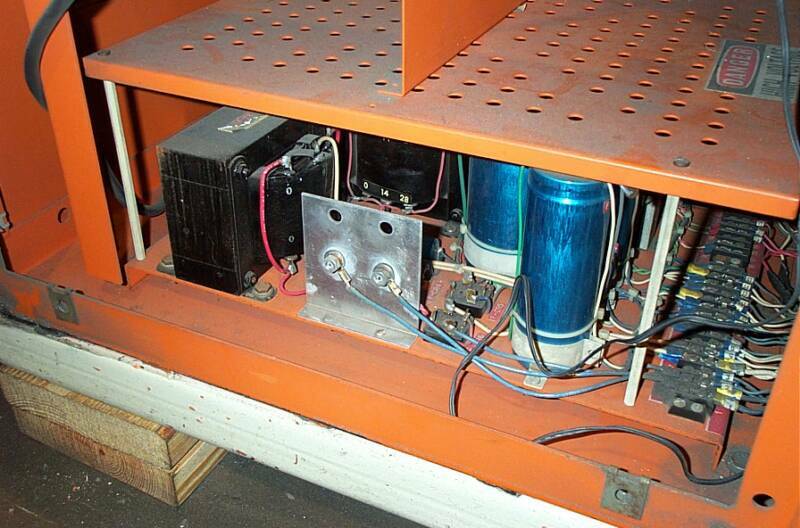 Hi-Ack Servo Drives, and was used on larger FC1250/30 and FC1250/40 Machines only. Built 1975 & 1976. Schematics #400060-000. This "30S3 Conversion" and "30S4" Controls were Improved & Updated, then became the "HC" Control (Houdaille Control). Also known as the "Compatibility" Control, as they were used on Both the FC1000 and FC1250 Machines. These Controls were made in 1976 and 1977. Schematics #400200-000.
the Final Version in this NC Hardwired Control Series. Build 1977 to 1979. Above NC Series of Controls were all "Hard-Wired", and were built with Hundreds of I.C. Chips connected with Thousands of Blue "Wire-Wrap" Wires. Controls had No CPU or Computer or Memory of Any Kind. These Controls Operated by reading the X, Y, and T information 1 Block at a Time from a Paper Tape, acting on this Information, then reading next block to Repeat this Cycle over & over again. 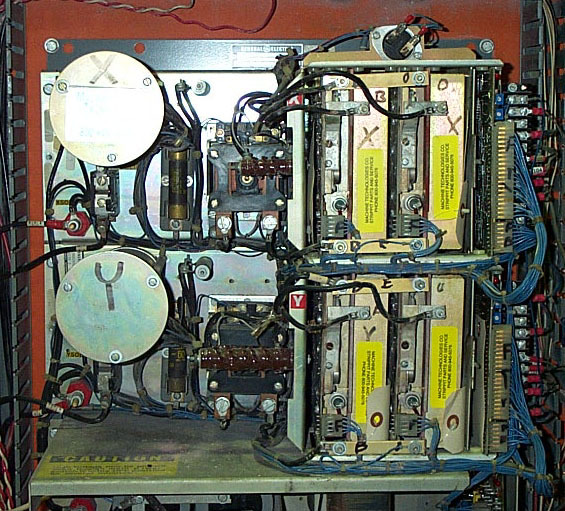 At Right is the "General Numeric GN6 Control". 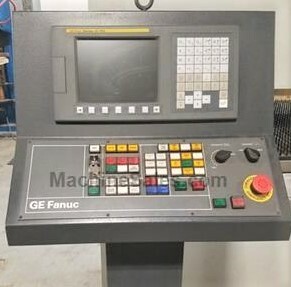 It Says General Numeric, but Every Part is Fanuc! 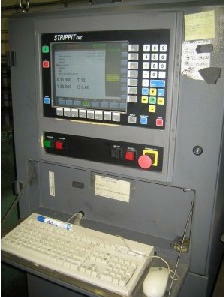 Control used Reliable Fanuc D.C. PWM Servo Drives which were usually built into Control Cabinet. 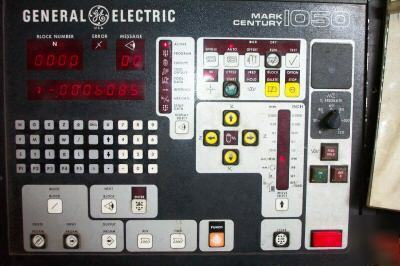 This was a very Popular CNC Control that was made through the 1980's. It was a Good Control, and Reliable, but was a Bit Intimidating to Operate, as it has Zillions of Knobs, Switches, Buttons, and Lights, so that it Looked like Tokyo at Night! 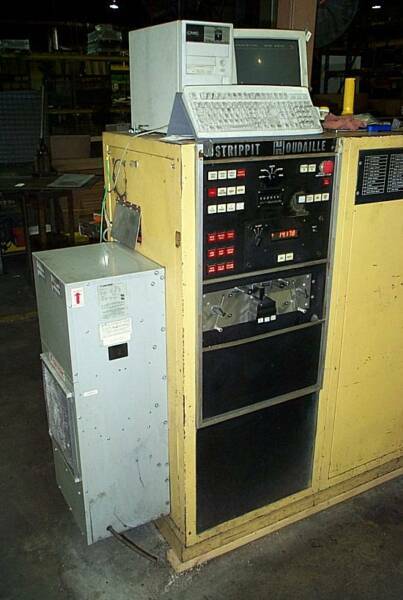 Strippit started Phasing-Out their HECC80 Controls in 1986, and Switched over to GN6 Controls on all FC1000/3 Machines, and later on, FC1250/30/1500 Machines and their other Big Machines. Most of Little Strippit Machines of this Era, like the FC630R & FC1000R, had Apple Mac & Windows P.C. Computer Controls that Strippit Hacked-Together. These are becoming Nightmares, as Many Parts are No Longer Available, and Strippit Can't Keep Them Running. They have become So Bad, that Strippit had to offer a Fanuc Retrofit, for about $80,000. Apple Mac & DOS & Windows P.C. Controls! "R" Machines were Also Offered with Fanuc Control as Extra-Cost Option instead of "Mac" Control. Good Machines, but not many were built. Di-Acro & Strippit also used GN6 on their Junk CAP1000 & CAP1250 & HPM1000 Machines they made, until late 1980's when Fanuc Discontinued GN6. 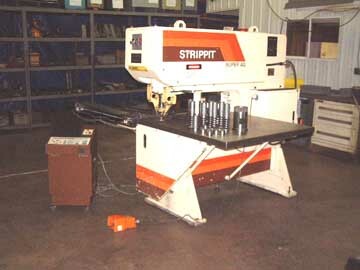 Then Strippit made a few more CRAP1000 & CRAP1250 Machines with Fanuc OP Controls, until Finally Discontinued these Machines around 1990. I will briefly talk about Fanuc CNC Controls as they are Now the World Leader in CNC Controls & Servo Drives. This is because G.E. 's "Neutron" Jack Welsh Capitulated, and "Nuked & Closed" All General Electrics's Control & Servo Drive Manufacturing Factories, Giving-Up Another Technology that was Invented in the USA, and Allowing the Fanuc Co. to Win The CNC Control Wars. Fanuc is now the Worlds Biggest Control Maker, and No One Else is Even Close in Size and Scope. So, Like them or Not, They are Here. Thanks "Neutron Jack". When Fanuc Originally Set-Up their American Division, they called it "General Numeric", a Nice American Sounding Name. This was to Avoid Japanese Sounding "Fanuc" Name and any Prejudices that may have gone with it. There was Much Government Scrutiny in the Early 1980's as Japanese were Busily Taking Over U.S. Machine Tool Industry. They have pretty well Completed this Mission now. G.E. Partnered-Up with Japan's Fanuc Co.
(Mighty G.E. Becoming More like Fanuc's Lackey-American Marketing Arm, Than a Real Manufacturing Co.) and the General Numeric Name Facade was Dropped. 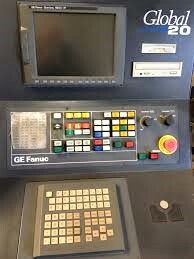 They then became the "GE Fanuc" Co.
an New & Improved GN6. 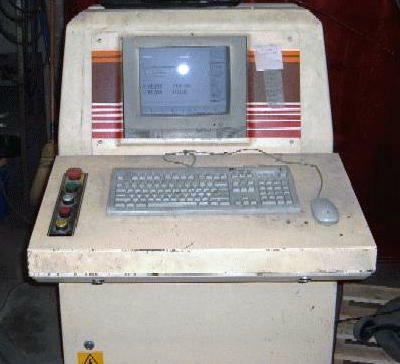 It had 7 "SoftKeys" under the CRT Display, like Strippit's HECC80/30x Controls had Years Earlier, a Technology that made the Control Much Simpler to Operate & Use. Control used A.C. Servo Drives, which are Improved Technology over older DC Drives. These Controls were built through out the 1990's in several Versions, and all are Good Reliable Controls. Recommended. The OP's have now been Replaced with the Next Generation of Fanuc Controls, which are called the "Oi". An Evolution of the older OP's, "i"s have some Nice features like Built-in Disk Drives, and LCD-Displays instead of older CRT-Tube Displays. They should be even better than the OP's, and are Recommended. However, How Good the Control Works Depends on How Good of a Job Machine Manufacture Does Integrating Control Interface to Their Machine. There are Many Complaints that LVD Strippit is Not Spending Enough Engineering Time on This Critical Interfacing, Which is Causing Many User Operation & Maintenance & Troubleshooting Issues. I Don't Particularly like the Fanuc Co. They have Become Arrogant from their Large Market-Share. Control & Servo Repair Part Pricing is Outrageous. Some Fanuc's A.C. Servo Motors are Priced at $10,000 to $25,000 with sometimes Months Delivery! What are You supposed to do with Your Production while Waiting Months? Older Fanuc Control & Servo Drive Parts are becoming "Unavailable". I think they are trying to Force You into Buying a New Machine with a New Fanuc Control on it! This is Certainly Not Very World Class. Fanuc is Very Secretive, and can be Difficult to Work-With. I have Never met Anyone who has even Seen Fanuc Control Electronic Schematics. Having said all that, they have Won much of the Worldwide CNC Control Business. Fanuc makes Good Reliable Controls, are one of the Biggest CNC Control Manufacturers in the World, and have a World-Wide Support Network. 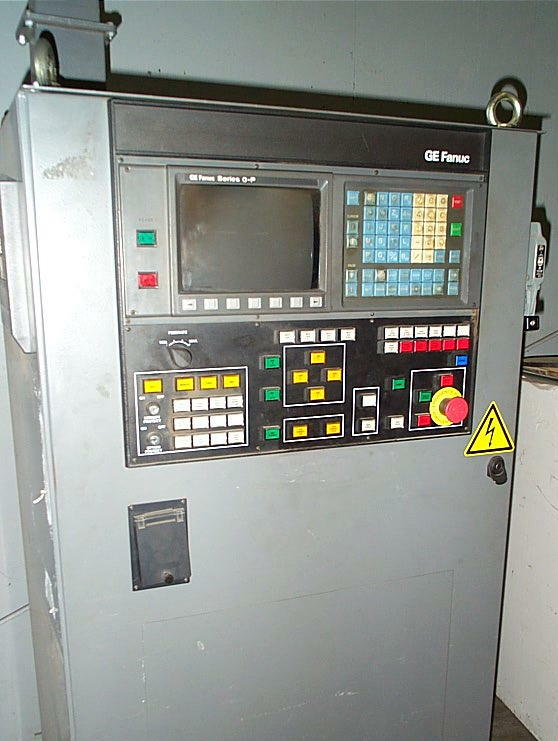 I would be Hesitant to Buy Any New CNC Machine unless it Had a Fanuc Control. Stud-Diodes Mounted on a Painted-Steel Heat-Sink that Does Not Dissipate Heat! Diodes get Hot enough to Burn-You if touched! This Heat Causes Diodes to Fail, and also Burns & Corrodes the 2 Wire Ring-Terminal Connections to Diodes. We Replace with a Larger Aluminum Heatsink, and Replace Old Wiring with with New Wires & Soldered-On Ring-Terminals. This Work Requires New Parts and a Technician that Knows what he's doing! McLean 6000 BTU Air Conditioner Mounted on Back of HECC80/1. Kooltronic 6000 BTU Air Conditioner Mounted on Side of "A" Control. Note! Air Conditioner's Draw a Lot of A.C. Power! to Provide 120 VAC, that Can Not Handle the Extra 15 Amp. Current Draw. Wire These A.C. Units to an External Power Source. But Run a Power-Cord all the Way back Directly to the Transformer itself! Stored in Battery Backed-Up Memory. Like in a Dealer's Warehouse, Without A.C. Power Being Connected to the Control, The Batteries will Run-Down, And All This Data Will Be Lost!!! Parameters & Set-Up Data Have Been Correctly Restored! This Data is Sometime Very Hard, or Even Impossible to get from the Original Machine Manufacturer. Make Sure you get ALL the Original Set-Up Sheets, PaperTapes, or Data Disks, To be able to Reload this Data!!! Or get In Writing a Iron-Clad Guarantee that Machine will Run when you Buy it! 1 -- Stud-Diodes CR1 & CR2 Overheat & Fail, usually Causing a Short-Circuit and Blowing Fuse FU1. 2 -- About 50% of the Time, the Blown CR1 & CR2 will Also Cause The Diodes CR3 & CR4 to Fail. 3 -- The Blown CR3 & CR4 Diodes will then Cause the Power Supply #1 Board in Slot S4 to Fail. We have a Repair-Kit Available that Replaces the Old Diodes & Heatsink & Wires with New Parts. And if the Power Supply #1 is Bad, We Can Quickly Repair it in Only 1 to 2 Days Turn-Around Time. After Strippit Quit Designing & Building their HECC80 Controls, they bought and used Fanuc Controls for their Big 30-Ton Machines. But, I guess to try to lower costs, Strippit could Not Resist getting back into making Their Own CNC Controls again. (Disk Operating System) and Not Windows. The Mac Controls were used on Many Versions of "R" (Rear Address) and 20-Ton Bridge-Frame FC1250 Machines, such as the FC1000R, FC1000XP, FC1250/20, Etc. While I tell people to Avoid these Machines, Don't Misunderstand me. They were actually quite good Light-Duty Machines and Mac Controls worked quite well also. The Problem is, these Mac Controls are now 15 to 20 Years Old, and are no longer Supportable! If your Mac goes Bad, you Can Not go to the Store and buy a New Mac as it will Not Work. You need to go to Flea-Markets & Ebay to try and find the Exact Same 25 Years Old Mac-Type (Like a Mac-Si) that YOUR Control was build with. And of course, you are buying someone else's 25 year old Worn-Out Junk Computer. It gets Worse. Inside Control & Mac Computer, Strippit used several Circuit Boards like Motion Control and P.A.C. Boards, that are No Longer Available ANYWHERE! Strippit will, for a Few Thousand Dollars, only Exchange These Boards. So You Get Someone Else's Problem Trade-In Boards that Strippit took a stab at repairing, and will probably give You a New Set of Problems! I hear this quite Often. I get Calls every week from Desperate people looking for these Boards or Repairs. Sorry, I have None of these PC Control Boards, and I do Not Repair these Boards. As Strippit used Many Different versions of MAC's, and Servo Drives, and I/O Circuit Boards, and Software's, Etc., The Knowledge to Correctly even work on these Controls is also being Lost as Time Marches On. There was a Customer who called In Strippit several Times to Fix his FC1000R MAC Control, but they could Not Repair it, and Customer Said Strippit just wanted him to Buy a New Machine. So he took Strippit's Advise, and Bought a New Amada Machine. are Even Worse that the MAC Controls. Avoid Them!!! Again, The Problem Here is Strippit's Poor Repair Parts Availability and Poor Support and Poor Service on Any Machine or Control that is a few years old. --- HECC80 Controls Hate Heat! First generation Control Cabinets had just Door Exhaust Fans. 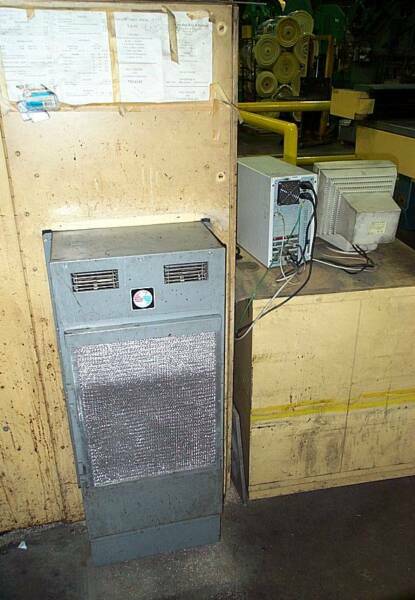 Then Strippit tried Heat-Exchangers which were just Air-To-Air Radiators. Then they Finally quit being Cheap, and installed 6000 BTU Commercial Grade CNC Cabinet Air Conditioners. These Greatly Improved Reliability. 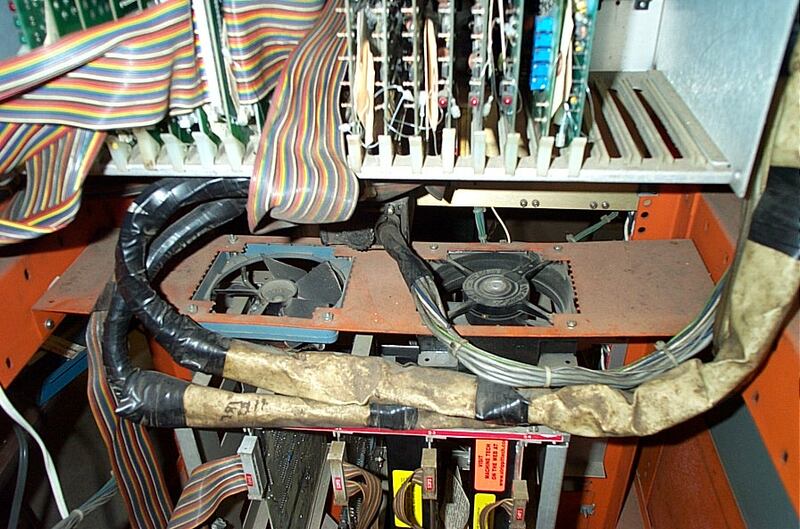 If your Control has a Air Conditioner, make sure it Works! If your Control does not have one, take off Door Exhaust Fans, Seal-Up the Cabinet, Insulate Doors with 4' x 8' Foam-Sheets from a Building Supply Co., and install a Commercial CNC Cabinet Air Conditioner! Do Not get Cheap, and install a Cheap Window A.C. Unit! They are Impossible to Mount Properly, they Spray-Water into Control, and Do Not Circulate Air Properly Inside Control. We can Drop-Ship Proper Air Conditioner Units for you to install. See A.C. Unit Photos Below. Early HECC80's did Not have Fans Under Cardcage. If you do Not Have These Fans, Make a Bracket, and Mount 2 or 3 -- 4 Inch "Muffin" or "Boxer" Fans Under Cardcage Blowing Upward! Also, Make another Bracket (We use 2 Pieces of Angle Aluminum) and Mount Another 4 Inch Fan Under the Power Supply #1 & Power Supply #2 Boards, Blowing Upward! --- Problems with the Raw-DC Supplies on the Floor-Plate. --- Problems with the Pre-Regulator Panel. These Problems Probably Will Require a Experienced Serviceman to Troubleshoot & Repair. and needed Turret Punch Machines for it's Manufacturing Plants. G.E. Insisted that all CNC Machines that they Bought have G.E. Controls on them. 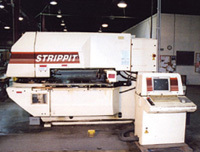 So over the Years, Strippit made a couple of Dozen "Special" FC1000/2 and FC1250 Machines with G.E. 1050 CNC Controls. 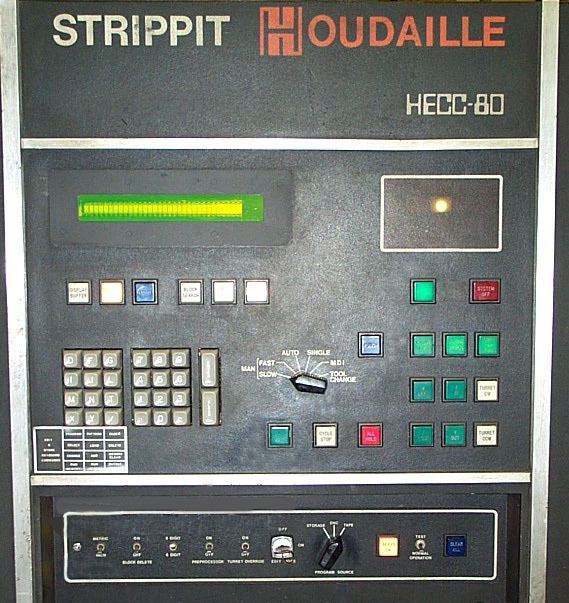 while the HECC80 was Custom Designed just for Strippit Machines. Very Weak from Strippit for G.E. Machines. These G.E. 1050 Controls, of Course, used the G.E. Model 2 Servo Drive System. Here at Machine Technologies, we Stock All of the G.E. Model 2 & 3 Hi-Ack Servo Boards & Components. Most of these old G.E. Strippit Machines have now been Scrapped. If you see one For-Sale, don't buy it! In the early 1980's, Strippit also used another Version of the G.E. Model 1050 Control on their Model FC75/30 Turret Punch Machines. These also used the G.E. Model 2 Hi-Ack Servo Drive System for the X & Y Axis Motor Drives. G.E. got in Bed with Fanuc, Closed all their U.S. Control Manufacturing Plants, so Support is Weak on these Old G.E. Controls. I would Not buy a Used CNC Machine that used an old G.E. Control. One Failure Modes of Earlix Control was Switch Overlay on Top of Control. Elizabeth at Cobra Ind. 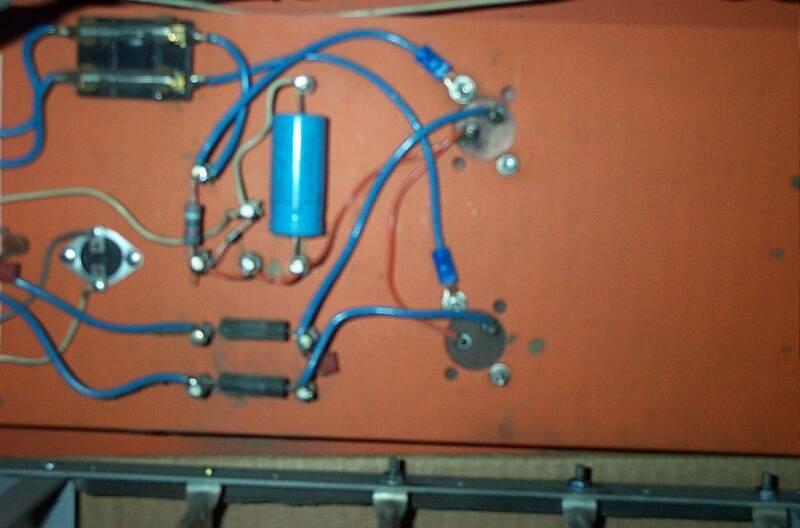 --- A Short-Circuit on 1 of the Control Circuit Boards in the Upper Control Cardcage. A Technician can Probe the 16 Test Points which will Point to the Board or Power Supply at Fault. There is More Information in Control Schematics and Control Maintenance Manual on how to do this. If you do not Understand how to do this, you are Not Qualified, get a Experienced Serviceman! A Bad Circuit Board can be Sent to Us at Machine Technologies Co. for Fast 48 Hour Repair Service! 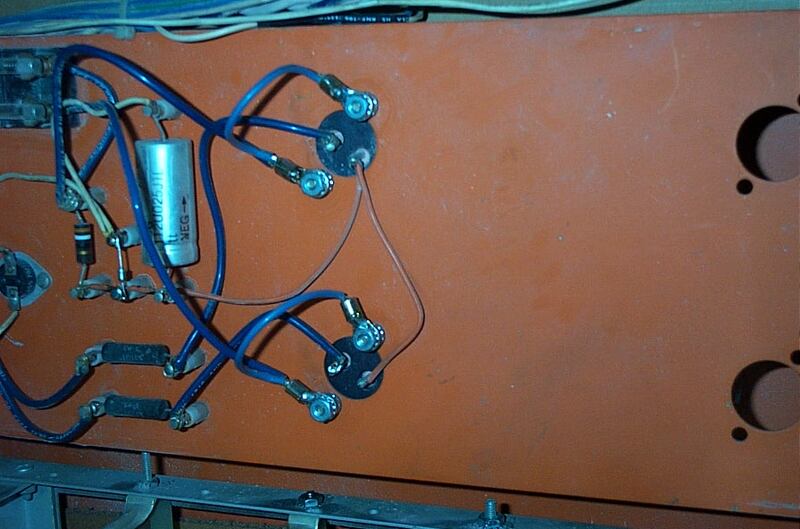 --- A Short-Circuit on Capacitors, Tapereader, Display, or Other Component on Control Front Door.